Doorhanger Envelopes make the billing part of your job easier. This was an idea I had years ago when we were visiting a friend in Long Island, NY. We were touring one of the exclusive boarding stables near her home, and the farrier had been there earlier that day. The shoeing bills were tacked to all of the stall doors with a horseshoe nail (what a waste of expensive nails!). Of course, we HAD to snoop and see what the prices were for shoeing and trimming on Long Island. It just doesn't seem like a good idea to leave the bills where they could be read by everyone, or be torn off and lost. 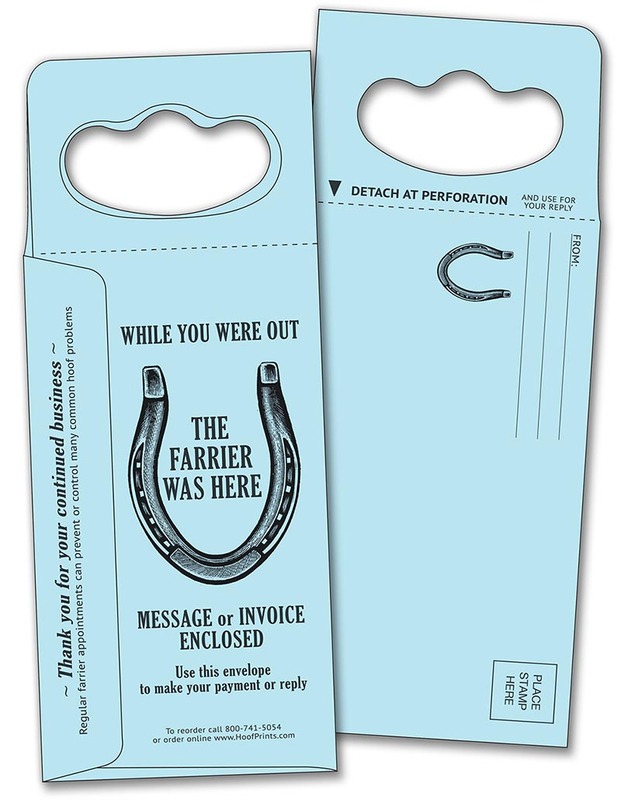 Leave your bills or notes in confidentiality with this special hanger that doubles as a return envelope. The reverse side has a place for your address and stamp. The hanger portion is perforated to detach easily before mailing. Was $10.00 - Now $7.95!